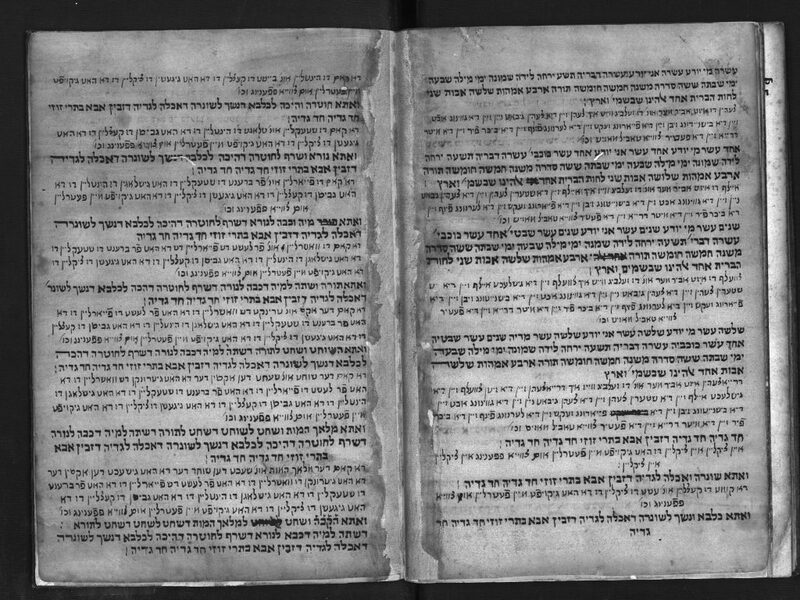 The earliest known appearance of “Ḥad Gadya,” by an unknown author, can be found in the Prague Haggadah (1526). The text of the poem is in a form of playful Aramaic and it is accompanied by the lyrics in medieval Yiddish.The Jewish Encyclopedia (1906, NY) vol. 8 page 190 s.v. “Had Gadya” calls it German. It is unclear which, if either, came first — the Yiddish or the Aramaic. 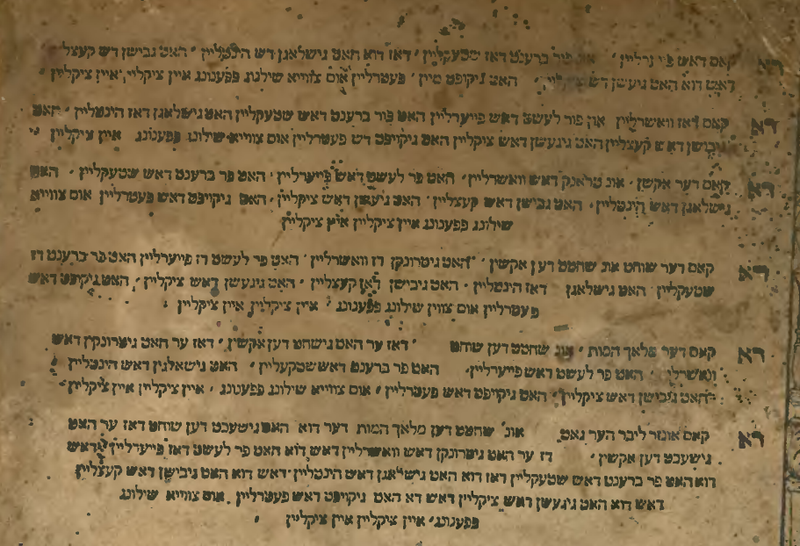 The transcription below follows the text as it appears in the Prague Haggadah (1526). 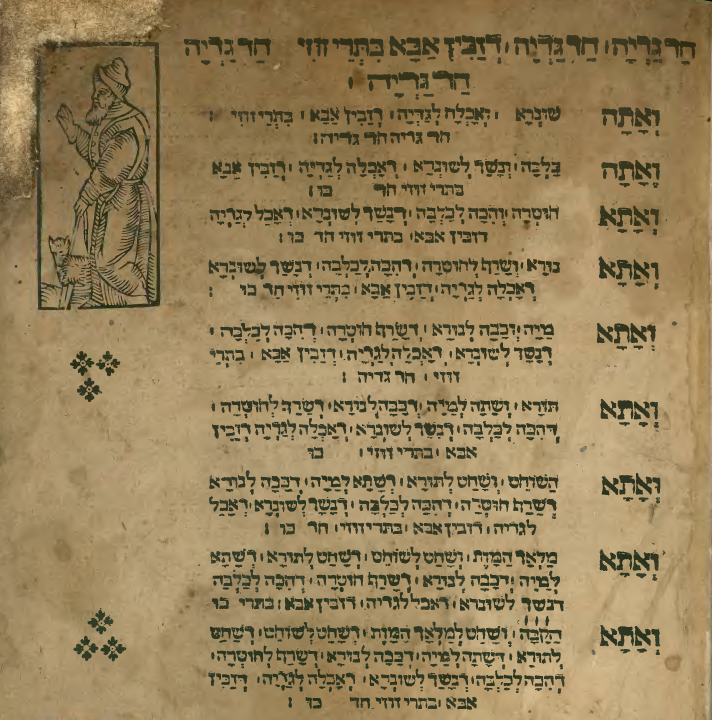 The Aramaic has been vocalized according to the Prague Haggadah (1590). do hat gikoyft meyn fetrleyn, um tsvey pfening, eyn tsikleyn, eyn tsikleyn. Da komt di ketsleyn un esht do tsikleyn do da hat gikoyft meyn fetrleyn, um tsvey pfening, eyn tsikleyn, eyn tsikleyn. Da kam do hintleyn, un beysht do ketsleyn, do da hat gigeshin do tsikleyn, do da hat gikoyft meyn fetrleyn, um tsvey pfening, eyn tsikleyn, eyn tsikleyn. Da kam do shtekleyn, un shlagt do hintleyn, do da hat gbishn do ketsleyn, do da hat gigeshn do tsikleyn, do da hat gikoyft meyn fetrleyn, um tsvey pfening, eyn tsikleyn, eyn tsikleyn. Da kam do fayrleyn un far brent do shtekleyn, do hat gishlagin do hintleyn, do da hat gbishn do ketsleyn, do da hat gigeshn do tsikleyn, do da hat gikoyft meyn fetrleyn, um tsvey pfening, eyn tsikleyn, eyn tsikleyn. Da kam do washrleyn, un far lesht dash fayrleyn, dash da hat far brent do shtekleyn, do da hat gishlagn do hintleyn, do da hat gbishn do ketsleyn, do da hat gigeshn do tsikleyn, do da hat gikoyft meyn fetrleyn, um tsvey pfening, eyn tsikleyn, eyn tsikleyn. Da kom der oks un trinkt dash washrleyn, do da hat far lesht do fayrleyn, do da hat par brent do shtekleyn, do da hat gishlagn do hintleyn, do da hat gbishn do ketsleyn, do da hat gigeshn do tsikleyn, do da hat gikoyft meyn fetrleyn, um tsvey pfening, eyn tsikleyn, eyn tsikleyn. Da kom der shoḥeyt un shekht den oksin, der da hat gitrunkn dash washrleyn, do da hat far lesht do fayrleyn, do da hat far brent do shtekleyn, do da hat gishlagn do hintleyn, do da hat gbishn do ketsleyn, do da hat gigeshn do tsikleyn, do da hat gikoyft meyn fetrleyn, um tsvey pfening, eyn tsikleyn, eyn tsikleyn. Da kom der Malakh haMovet un shekht den shoḥeyt, der da hat gishekht den oksin, der da hat gitrunkn do washrleyn, do da hat far lesht dash fayrleyn, do da hat far brent do shtekleyn, do da hat gishlagn do hintleyn, do da hat gbishn do ketsleyn, do da hat gigeshn do tsikleyn, do da hat gikoyft meyn fetrleyn, um tsvey pfening, eyn tsikleyn, eyn tsikleyn. HaQadosh Barukh Hu da kom unzr libr her got un shekht den Malakh haMovet, der da hat gishekht den shoḥeyt, der da hat gishekht den oksin, der da hat gitrunkn dash washrleyn, do da hat far lesht do fayrleyn, do da hat far brent do shtekleyn, do da hat gishlagn do hintleyn, do da hat gbishn do ketsleyn, do da hat gigeshn do tsikleyn, do da hat gikoyft meyn fetrleyn, um tsvey pfening, eyn tsikleyn, eyn tsikleyn. Making sense of Ḥad Gadya beyond its explicit meaning has long inspired commentary. For me, Ḥad Gadya expresses in its own terrifying and macabre way a particularly important idea in Judaism that has become obscure if not esoteric. While an animal’s life may today be purchased, ultimately, the forces of exploitation, predation, and destruction that dominate our world will be overturned. A new age (olam habah) will dawn in which Nature will be sustained with compassion and fairness, and without creatures required to eat one another. וְעָבַרְתִּ֣י בְאֶֽרֶץ־מִצְרַיִם֮ — אֲנִי וְלֹא מַלְאָךְ. וְהִכֵּיתִ֤י כָׇל־בְּכוֹר֙ — אֲנִי וְלֹא שָׂרָף. וּבְכׇל־אֱלֹהֵ֥י מִצְרַ֛יִם אֶֽעֱשֶׂ֥ה שְׁפָטִ֖ים — אֲנִי וְלֹא הַשָּׁלִיחַ. “I will pass through the land of Mitsrayim:” — I, and not an angel. “and I will smite every firstborn:” — I, and not a fiery angel. “And I will execute judgment against all the gods of Mitsrayim:” — I, and not the messenger. “I am YHVH” — I, and no other. In Jewish belief, there is one and only one divinity responsible for light and dark, suffering and joy. The invocation of the most dangerous and harmful aspect is limited to the one day dedicated to telling of the birth of the people and in which the divine acts as midwife and guardian/protector of her people. This aspect, however, is destructive, and so is related to predation, the yetzer hara as described in Yoma 69b, a crucial mechanism by which the nature of our world, Olam Hazeh, is sustained. 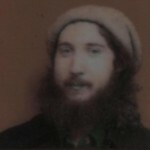 The significance of our founding as a people, however, is to study the Torah so as to circumscribe our predatory inclination with kindness and consideration, ethics and laws, so as to realize what Isaiah articulated in his vision — “They will neither harm nor destroy on all my holy mountain, for the earth will be filled with the knowledge of the YHVH as the waters cover the sea.”Isaiah 11:6-9 Our world may be a bloody nightmare sustained through violent predation, but we hope for a new age in which the divinity suffusing all of creation is apparent to all and that even nature itself may be sustained in peace, kindness, and consideration. Our most ridiculously labor-intensive animation ever! 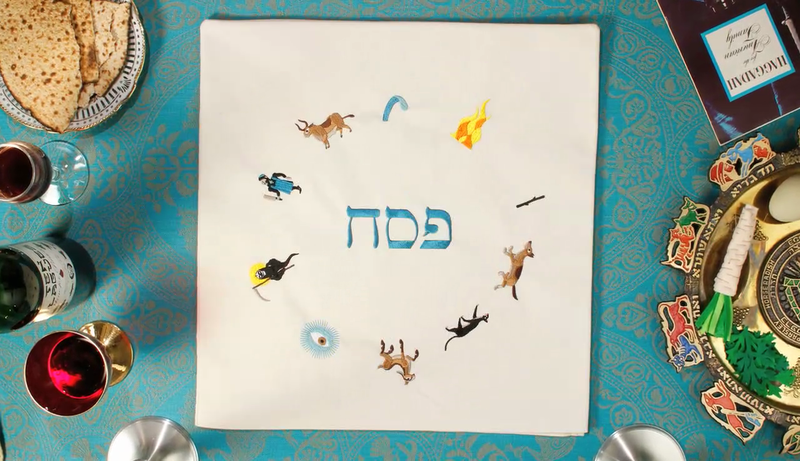 The traditional Passover folk song rendered in embroidermation by Nina Paley and Theodore Gray. “חַד גַּדְיָא | Ḥad Gadya in Aramaic and Yiddish (Prague Haggadah, ca. 1526)” is shared by Aharon N. Varady (transcription) with a Creative Commons Attribution-ShareAlike 4.0 International copyleft license. Please reciprocate for any adaptation or redistribution of this work by (1) properly attributing the work to Aharon N. Varady (transcription), (2) clearly indicating the date you accessed the resource and whether any changes have been made (and if so, please be in touch with us and leave a comment below so that we might note your adaptation or improvement), (3) providing a link back to this source, and (4) specifying the under which this work was shared.